Although zombies have a long history of appearances in religion and folklore, interest in them as villains in horror films is largely confined to the second half of the 20th century. The explosion in zombie popularity is based on a characterization established by a single film and the fact that the original characterization of the zombi in African folklore and religion, as well as in earlier films, is dramatically different from that of the popular characterization from the 1960s onward. To understand zombies in both their original context and in the role they have come to take in popular culture requires an understanding of two divergent traditions. Brought to the New World by African slaves, this zombi concept was the only one utilized in the few zombie films that were made in the first half of the 20th century. These include 1932’s White Zombie and 1943’s I Walked with a Zombie. Both of these films used a traditional zombi setting involving Caribbean islands, black laborers, and voodoo magic. Based loosely on Jane Eyre, I Walked With a Zombie also anticipated the modern trend of inserting zombies into classic works of literature, such as Pride and Prejudice and Zombies (2016). It was not until 1968, with the release of Night of the Living Dead, that the currently popular characterization of zombies was established. Directed by George Romero on a budget of $114,000, the film was rejected by all the major studios of the time due to its violence and disturbing ending and was released independently through the Walter Reade Organization. The film was originally titled Night of the Flesh Eaters but was renamed Night of the Living Dead to avoid conflict with a similarly titled studio release. Although the film became hugely successful, the film’s title change led to one of the major controversies surrounding it; the new title cards attached to the film contained no copyright notice! Not only did this mean that Romero could not claim ownership of the film (and it therefore lapsed into public domain), it led to conflict between Romero and his co-writer, John Russo. Romero has directed five sequels to Night of the Living Dead so far; Dawn of the Dead (1978), Day of the Dead (1985), Land of the Dead (2005), Diary of the Dead (2007), and Survival of the Dead (2009). At the time Romero was releasing Day of the Dead, Russo released his own sequel to Night of the Living Dead, titled Return of the Living Dead. The film and its advertising campaign were so similar to those of Romero’s series that Romero filed a lawsuit for copyright infringement against Russo. Although the court mandated that Russo cease his advertising campaign, the film was allowed to retain its title because “Living Dead” had never been copyrighted. This allowed many unlicensed adaptations of Romero’s films to continue being released, both in the U.S. and around the world, with similar sounding titles. Romero established much of the characterization and biology of modern zombies. They were portrayed in his films and most thereafter as ravenous creatures that attacked in groups, tried to devour human flesh, had no discernible intelligence or memory, and could only be killed with a blow to the brain. In 1999, the Library of Congress placed Night of the Living Dead on the National Film Registry as a film deemed “historically, culturally or aesthetically important,” and the film deserves this distinction for its huge impact on the horror genre and all subsequent zombie films. A new era of popularity for zombies began with the release of Danny Boyle’s 28 Days Later in 2002. This film changed the basic characterization of zombies from slow, shambling creatures into fast-moving predators that could ambush or chase down their victims. A sequel was released in 2007 called 28 Weeks Later. Zombies have also been used in a comedic context in films such as Shaun of the Dead (2004) and Zombieland (2009) suggesting that interest in zombies transcends the realm of pure horror. 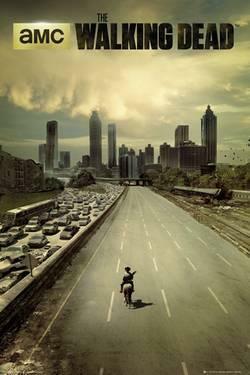 Even more popular than any zombie movie is AMC's television series The Walking Dead. Based on a number of comic books by Robert Kirkman, the series follows a band of survivors who travel around southern America, seeking shelter from the sudden outbreak of a virus that turns its victims into moaning, hungry, flesh-eating zombies. The series has almost 20 million viewers and is beginning its seventh season in October 2016. A spin-off series, Fear the Walking Dead, began its fourth season in June 2017. Many theories have been proposed to explain the current wide-reaching popularity of zombies.Are they a projection of an ancient survivalist instinct? Are they the embodiment of the individual’s alienation from family and society in general in an increasingly technological world? Whatever the cause of the fascination with zombies, it appears it will remain a part of American culture for years, possibly even decades, to come. For more on zombie movies, check out this article on 5 classic zombie films.